I don’t know if it’s been mentioned here yet, but we here at Ripe Avocados are huge fans of everything Moosewood. In case you don’t know, Moosewood is a collectively-owned vegetarian restaurant in Ithaca, NY, and they’ve put out a whole line of amazing cookbooks. I even made a pilgrimage to the original restaurant once (ok, it was on an incidental trip to work) and yes, it was incredible. 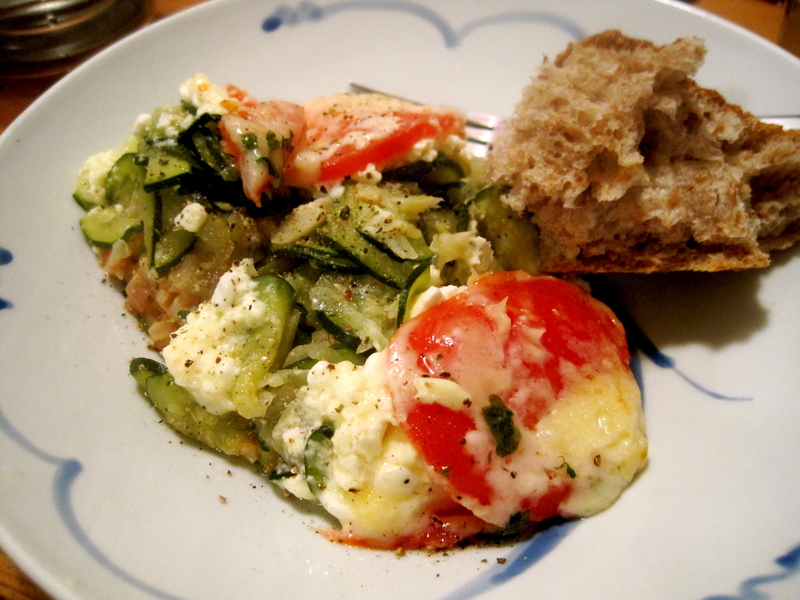 Zoe and I have been getting together for Moosewood cooking nights lately, and this recipe was too good not to share. Layers of spiced tomato rice, sauteed garlicky zucchini, and three types of cheese make for a well-rounded tray of comfort and flavor. 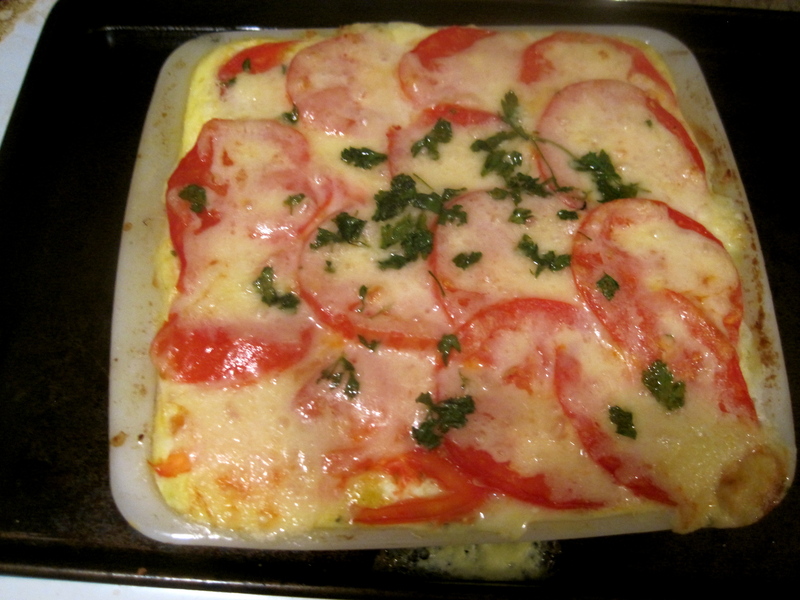 1 1/2 tsp greek/italian herbs–we used a blend of basil, oregano, and rosemary. 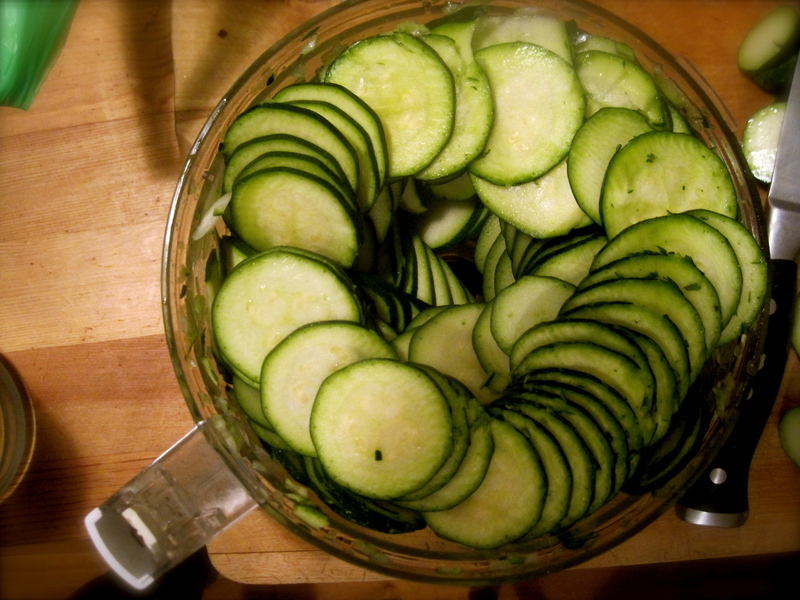 Using a food processor makes slicing all that zucchini pretty easy! If you don’t have rice precooked, don’t forget to start it while you’re cutting up the veggies. 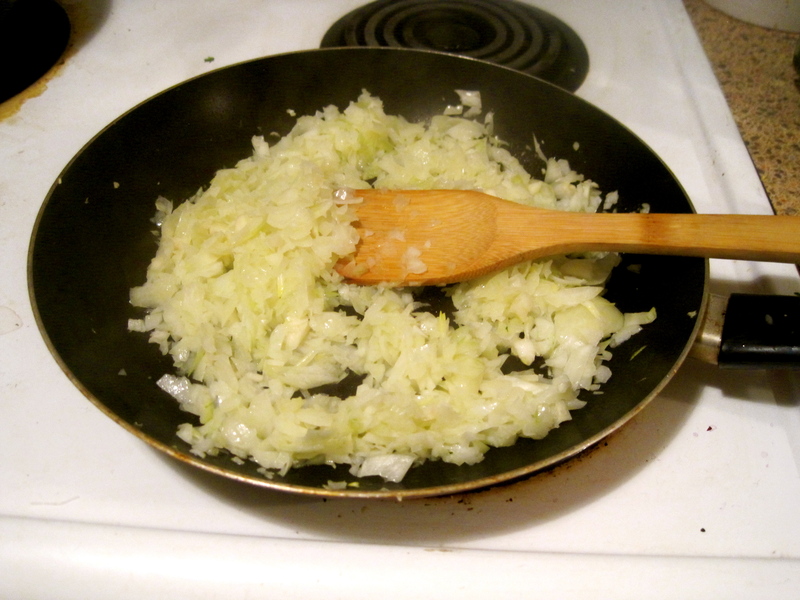 Start by sauteeing your garlic and onions until the onions are translucent. 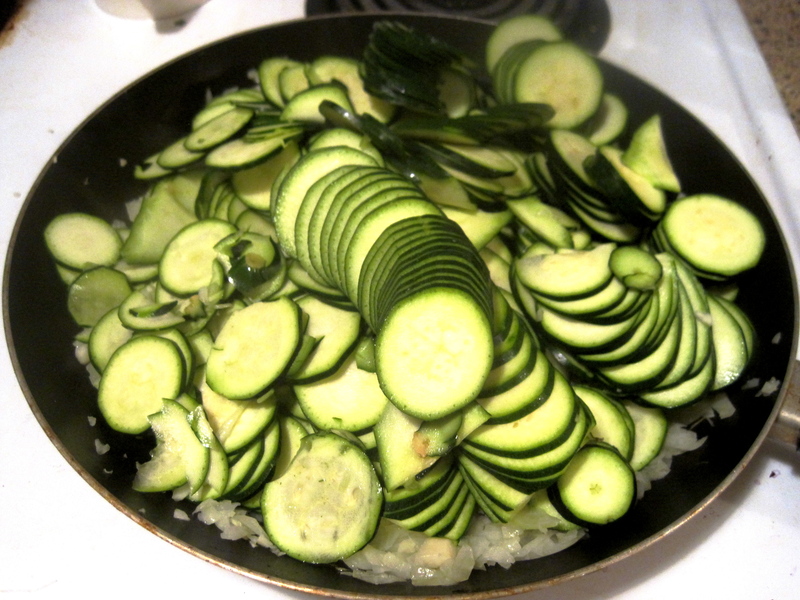 Add your one million zucchinis (and use a larger pan than I did) along with your herbs and black pepper and sautee on medium low until zucchini is soft and has lost most of its water. 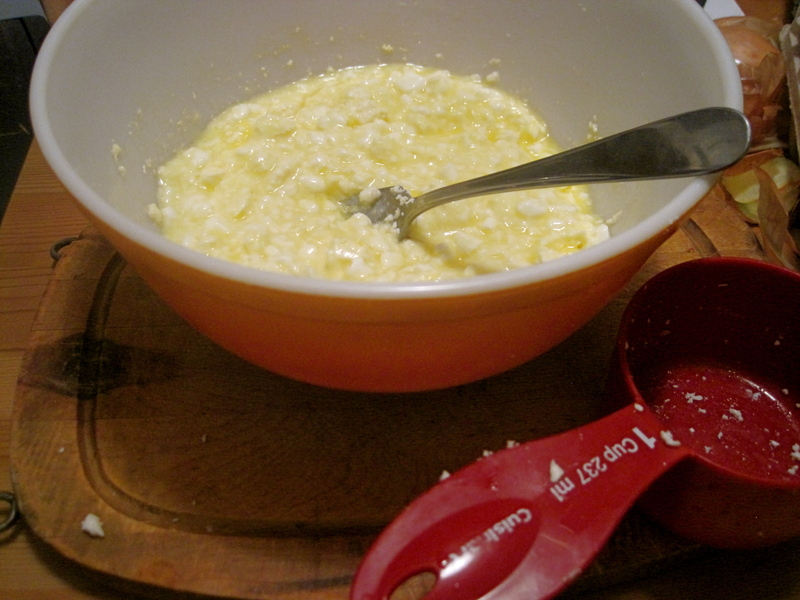 While that’s going on, mix up your penultimate layer of lightly beaten eggs, feta, and cottage cheese. Add the tomato paste, parsley, and soy sauce into your rice when cooked and set aside. Oil a 9×9 casserole dish. 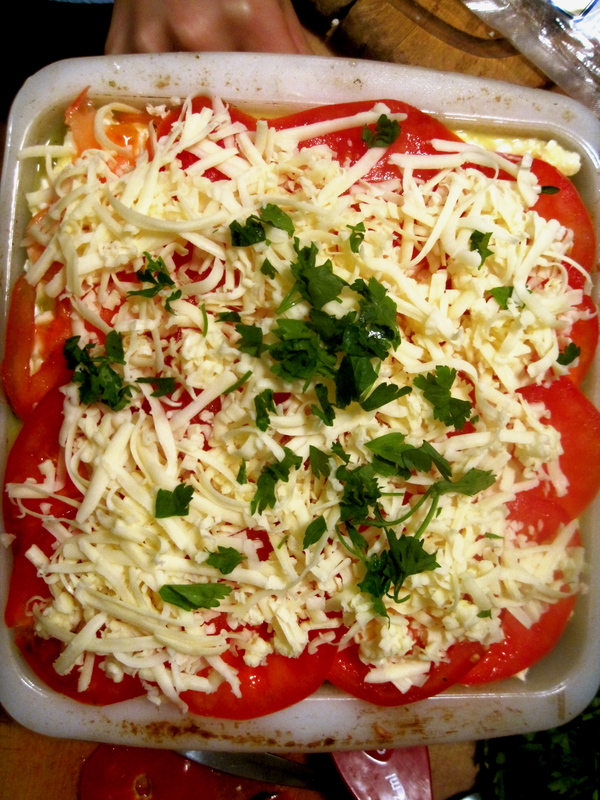 Spread the rice across the bottom, then add the zucchini mixture, then the egg and cheese mixture, and top with sliced tomatoes and then cheddar cheese and a little parsley as a garnish. Fight off shadowy kitty cheese thiefs. Cover with aluminum foil and bake at 350 for 45 minutes. 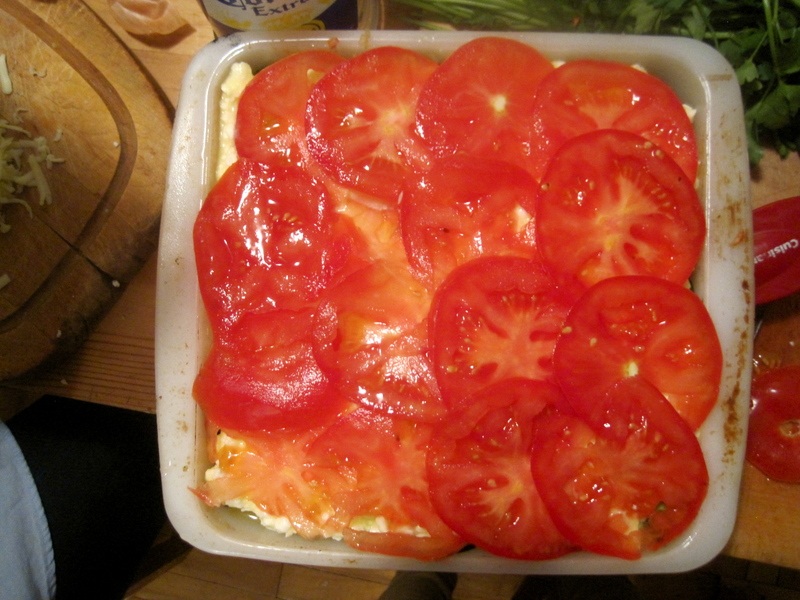 We ended up having to put ours on a baking tray because the cheese kept bubbling over the sides. 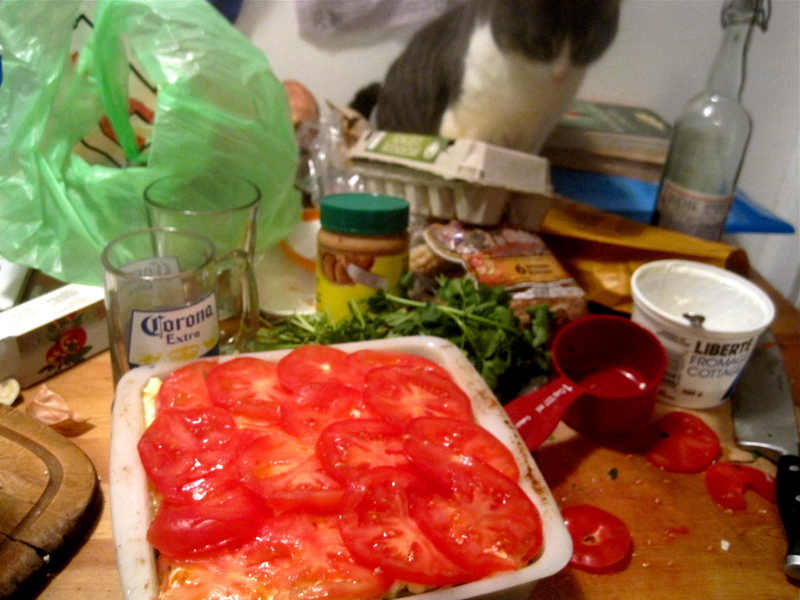 I forgot to do this, but you should uncover it for the last ten minutes for extra-crusty cheese. It’s sooooo beautiful!! Enjoy with an extra grind of black pepper and a hunk of crusty baguette!